Today is the first business day of the 2016 Creative Workforce Fellowships in Cuyahoga County. I am honored to be among the 40 artists to receive fellowships this year and plan to make huge new sculptures and performances. Part of the fellowship is public engagement, so I figured it was a good time to begin updating everyone about what I am making. I plan to post updates about my studio activities throughout the fellowship year. Artists always need new tools and machines to make new work, make bigger work, make more efficient work and to stretch the realms of possible. I bought my first semi-real sewing machine in 2008 while on a Fulbright Grant in Japan. Unfortunately, that was after wasting money buying a not so nice sewing machine from the store that did not last a month in the studio. I have a fond memory of grad students walking in to see me sawing off the plastic case of my little sewing machine so I could replace part of the “non user serviceable” tensioner. That gave it a few more days to finish the project but is soon broke completely. Then I purchased a relatively decent consumer sewing machine from a sewing shop in Nagoya. The machine only sewed in a straight line but it was fast and tough. I still have that machine and used it to sew my most recent inflatable Please, no smash that was part of the How to Remain Human exhibition at the Museum of Contemporary Art in Cleveland, Ohio. It is a trusty machine and I will still use it often to fasten zippers and make garments. But now a new tool occupies the studio. Over the weekend at Globe Sewing Machine in Cleveland, Ohio and I bought a new double needle sewing machine. The thing is a beast and weighs about as much. The machine can sew through double layers of webbing with two rows of beautiful and strong lockstiches, saving me a lot of time fabricating in the studio. 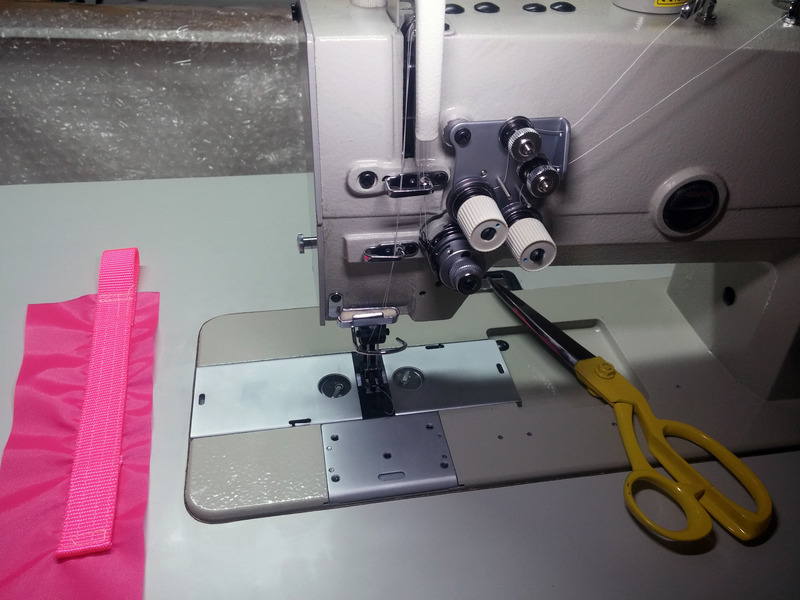 I tested the machine out briefly and installed it in my sewing studio. I am just waiting for the fabric to be delivered so I can begin fabricating new inflatables. Speaking of fabric, today I ordered four rolls of bright red 200D polyester fabric that will become huge inflatables for an upcoming exhibition. I also ordered lots of red wedding and thousands and thousands of yards of bright red polyester bonded Tex 70 (69) thread. Can’t wait to get sewing.